Oooh bet you're dying to know what I'm talking about, bet you're even thinking along the lines of a diamond necklace or a stunning dress or to die for shoes? Nah, I mean something that all women should have at home, especially the Homemakers like me. Yeah I bet you didn't see that coming did you? Well that is my new friend, my very own Home Tool Set. I picked it up at Home Depot for only $9 but I promise it will be worth it. I know as women we tend to shy away from tools, and actually for the longest time, well, years really, everytime something needed to be done in the house I turned to my dear husband. Truth be told, at first it was very confusing when I said I may need a screwdriver and was met with "Phillips or Flat head?" Nothing like that to make my instant "I am so smart and can take care of this myself" mood fade quickly. Now being a military wife, I quickly learned that the minute my husband's boots left American soil, everything and I mean EVERYTHING broke down around the house. It's frustrating being left with no knowledge of how to fix anything and not quite sure of which tools to use where or how. I decided right after his first deployment, that I needed to be taught as much as possible and needed to learn to fend for myself. No more running to hubby when a light bulb blew, or one of the hinges on a kitchen cabinet came loose, or a cute little storage shelf was left in a box because the thought of putting it all together made me break out in hives. I took charge and I started asking for direction, instead of leaving it to him to fix, he supervised and now I can proudly say that if anything breaks in this house, I truly can pretty much fix it myself. It may start with something as simple as putting up a curtain rod but pretty soon, you will feel comfortable enough to do anything around the house. Don't be scared off by the fact that you are unfamiliar with tools and what they do, just step over that hurdle and remember that it's another step towards being independent. To know that if the need arises, YOU can fix whatever is broken and you have the means to. So next time you're in a Home DIY store or Walmart or Target etc, don't be shy to grab your very own Tool Box. Nowadays they even come in Pink. Ooooooohhhh, I'm thinking a pink drill, pink tool pouch......hmmmmm. Now go forth and conquer the DIY around your home and be thrilled that you can get the pleasure out of saying "Hey I fixed that all on my own". It's a pretty darn good feeling. Tell me, do you have your own tool box? Do you know which tool does what? Do you fix things around the house or are those chores left to your husband? Jessie gains footing in her dream to one day operate her own studio and soon finds herself in other Midwest towns, pursuing her profession. But even a job she loves can’t keep painful memories from seeping into her heart when the shadows of a forbidden love threaten to darken the portrait of her life. I am sad to say that this was my first Jane Kirkpatrick book, because after having read this one I can tell you that I'm now a huge fan. What a great book, superbly written. It is inspired by the wonderful stories told through her grandmother’s photographs taken at the turn of the century, 1900's Wisconsin. Now I probably would have picked to read the first book "A Flickering Light", had I had the choice, but I think it's a good stand alone novel too. I truly enjoyed the story as it unfolds, as we get to know Jessie better, as we get to see her flourish and expand her capabilities as a photographer and try to follow God's will. Being that I immensely enjoy photography too, having the chance to see the portraits in the book was also an added bonus. It gives you an insight into the struggles that women faced during that era and especially a woman that was trying to start her own business. I found that it started off a little slow but it quickly picked up and I loved every page until the end. Great book. To purchase this book, you can click here, or the book image at the beginning of this post. I was puttering around my blog earlier today and came across my list of followers. Usually, I don't take much notice, I mean, I do see the followers and all the pretty faces but I don't take note of the number. Good Golly Miss Molly, I have the most amazing readers. Thank you all, all 313 followers, truly, from the bottom of my heart, Thank You! You know I started blogging 4 years ago, just on a whim, I had been blog reading for a while but never quite felt comfortable enough to open my own space, to write anything, I mean, I'm just a simple woman, a mom, a military wife, a homemaker. Who would be interested in anything I have to write? But over the years I have come to love my little corner on the web. I have met amazing women and men of all walks of life, of all different ages and different cultures but bonded by one thing in common, the love for our families. And I'm always amazed and touched when I post about my life and my days and are met with so many wonderful comments, so many words of encouragement. I don't think I've ever truly thanked you all for the time you take to stop by and say hi, even when I have nothing interesting going on. You inspire me. You make me want to keep blogging about everything and anything, and if by some chance I give even just one person out there, hope or motivation or a simple smile, then my time is well spent. Just know that every single one of your comments means the world to me. You guys rock! John Adams - HBO mini series following the life of the extraordinary man that was John Adams. Bisquick Upside Down Pineapple Cake - it was so so so good, it didn't even last one afternoon in my house, and that says a lot because we're not really cake people around here. There's nothing scheduled for this week, so I'm just looking forward to more spring weather and more time spent outdoors enjoying the fresh air. Removing glue from countertops, we've all been there, you accidentally spill some and next thing you know you have this hard annoying little blob that you just can't seem to get rid of. The Joy of Reading from I live on a farm. Such a good post. Shining Egg - Another newly discovered blog that I'm really enjoying reading. Something about this picture just brings the biggest smile to my face. I want to be there, right next to the little kids and the puppy, in that beautiful field, surrounded by fireflies and the moonlight. That I'm not as young as I used to be and no matter how much I tell myself that, my body is always reminding me to take it slow and not over do it. This annoying back pain that I'm dealing with. I seem to have pulled a muscle this weekend and it's smack dab in the middle of my spine, it's frustrating and annoying and I am reminded that there are just way too many muscles directly connected to it. UGH! Even reaching for a cup is painful. 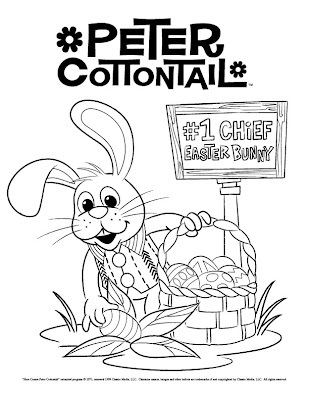 Peter Cottontail wants to be the #1 Chief Easter Bunny and everyone in April Valley agrees…except for his archrival, evil Irontail. Hop along with Peter and his friends as they race through time celebrating all of your favorite holidays to deliver the most eggs…and save Easter for children everywhere! I was so thrilled to be asked to participate in this review. 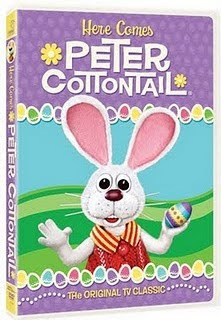 I love Peter Cottontail and I think it is the perfect children's show for Easter time, I think there aren't enough of these shows around to celebrate that holiday. When my kids arrived home from school, they asked if they could watch it too, they couldn't exactly understand why I was so happy with this DVD, I guess they found it a little weird that their 35 year old mom was all giddy over a little bunny rabbit. The good thing is that they loved it as much as I did and since then, my 6 year old has watched it again. Thumbs up! When I'm reviewing a product like this I always count on my children's thoughts, because after all, it's geared towards the little ones, so it's great to be able to say that they really enjoyed it. 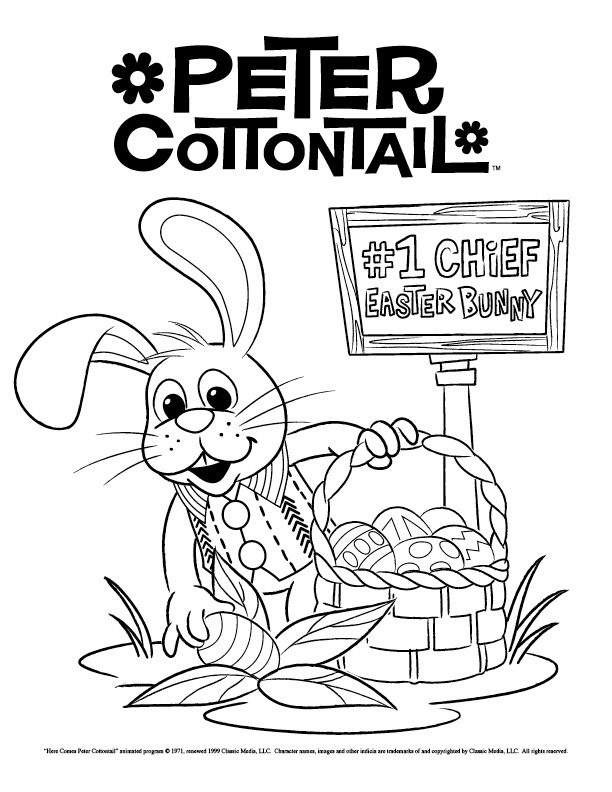 Nicholas also had fun coloring this printable coloring page and I'm sure your little ones will too, just right click on it and save it to your own computer. And here's the best part, just in time for Easter, I have TWO copies of this amazing DVD to giveaway. That's right, TWO Here Comes Peter Cottontail DVD's that will make a little one (or big one) very happy. All you have to do is leave me a comment, and no I'm not going to make you run to the corner of the street, or bend over and touch your toes, or follow me, or tell me your life story, or post about this on your blogs or anything. I believe in keeping things simple, so all you need to do is say hi and let me know who you will give this DVD to if you're one of the winners. That's it! Contest is open to US and Canada only. It will end April 2nd at midnight and then I'll choose the winners using Random.org. Good Luck everyone! It's that time again. You know that time, where you ask me whatever question you have, as long as they're within reason of course, and I answer back in a video. I did this last year and had some great questions asked, so here is your chance again, if you want to get to know me better or have anything you want to know about my blog, military life, crafting or whatever, feel free to ask. Here's a great Easter recipe for the kids, they'll love these cute bunnies. Mold marshmallows into sweet mini bunnies that are a treat to eat. Using scissors, make a diagonal cut in the upper left corner of the marshmallow. Gently lift the corner and make a snip down the middle. Use your fingers to separate the ears and angle them outward. From the point where the first cut was made, snip to the middle of the marshmallow. Pinch the cut end slightly to form a rounded tail. For the bunny's face, make an 1/4-inch horizontal cut midway between the base of the ears and the bottom of the marshmallow. Create the feet by making a diagonal cut in the lower left corner of the marshmallow. Divide the feet as shown. Using a toothpick dipped in food coloring, draw on the eyes, nose, and whiskers. It's been a really quiet day around here, I got all my housework done yesterday and other than the usual daily clean ups, I have taken the day off, to just relax and do absolutely nothing. Yes, I do, I don't know what it is about me but if I'm not busy doing something then I get this overwhelming guilty feeling, like my husband and children will look at me and think "Man, she's lazy". Ridiculous! They love me irregardless and are usually the ones telling me to sit down, to forget about mopping this very minute or ironing those clothes before bed. It doesn't help that I have a bit of a headache today and feel a little congested, my allergies are flaring up, but nothing some peace and quiet and a Claritin won't cure. So instead of the posts I had in mind for today, I am just going to leave you with some pictures, some signs of spring and a beautiful sunset. Then I'm off to pick up my babies at school and scrounge up some dinner. By the way, over on Full Bellies, Happy Kids, I have a great mid week recipe that the kids will love. Cheeseburger Pie! Yum! The Landscaping people came around and chopped down all my honeysuckle, I was so distressed, but thankfully they are starting to grow back. There's something about close up nature pics that make me smile. Maybe it's because I can see every little detail in the trunk and every little line on the leaves, it just makes me realize what a wonderful God we truly have. My lemon tree is thriving as always, right now it's filled with not only lemons but lemon blossoms and it fills my back yard with the most delicious scent. The bees think so too. Last night's sunset was stunning, as always. Liz Curtis Higgs is one of my favorite authors and though she hadn't published a book for a while, she came back with a bang. What better way to retell the biblical story of Ruth and Naomi than to put it in a completely different setting, different time, different country. I can not tell how much I enjoyed this book, I picked it up and literally couldn't put it down, I was completely immersed into the Scottish culture right down to the language, which for some may be a little confusing at first, but I love languages and find it riveting. It was a story well told, I couldn't help but fall in love with each character though my favorites were definitely Lord Donald Kerr and Lady Elisabeth Kerr, it was very interesting seeing these two in love but also holding back secrets from one another. The relationship between Lady Marjory and her sons was also interesting to see, as a mother I could totally relate to the love she had for her children, even though grown men she still wants to protect them and take care of them.....and then there's the intricate relationship between her and her two daughter's in law, mainly Lady Elisabeth as she's a Highlander by birth but now a Lowlander to her marriage to Lord Donald. All in all, this book was amazingly well written, the characters are were likeable and I enjoyed the history behind Scotland of 1745. If you're a Liz Curtis Higgs fan, you won't be disappointed. To read the first Chapter you can go here. These books were provided for review by the WaterBrook Multnomah Publishing Group. My babies went back to school today and I was so sad to see them go. You know it kind of confused me a bit when I dropped them off this morning and heard some of the other moms saying things like "Thank God Spring Break is over. I'm so glad they're back at school, I need a break". I know that not everyone is the same and families are different but I for one absolutely love every moment with my children and I was sad to see the Spring Break come to an end. With that said, I do enjoy my quiet time alone too and once I returned home, I started by having a piece of toast.....my favorite way. A slice of bread toasted over an open fire, or this case, the stove. I had some hotdog buns laying around and that is what I used for my toast. YUM! After getting the breakfast dishes taken care of, I grabbed a big cup of coffee and got to work on some things around here. Oh the usual, laundry and more laundry and yet more laundry, then folding and ironing and putting away, straightening up the living room from the weekend activities and sweeping and mopping. But once that was done, I sat down and got to work on some projects that I've had laying around, desperately needing my attention. With the weather being just wonderful outside, I donned on some shorts and a tank top and got to work on painting some stuff. This little shelf sits in my kitchen and I love it, just adore it because my husband made it for me right at the beginning of our marriage, and the fact that he put in a C and an S for our initials makes it that much more special. This one is in my living room right above my TV. I also painted those and added our names. Live Simply.....beautifully explains what my life is about. In the entrance way to the house, on my left I have a cute bench and right above this shelf, I made this super simple little dress and used a branch and some twine to hang it. I also have some dried lavender and a little bonnet to hang on either side. Then I stepped out side, yesterday I had hubby build me this really simple looking bench, then last night I painted it Colonial Red (love it). I placed it underneath my kitchen window. The little red flag holder was actually an old dog treats container which the lid got broken. It's perfect to hold my flags, just put in some of those rocks to hold them in place. Added the little tin star above and I made the sign this morning. It's not perfect, and I don't want it to be.....it's not the way the words are written on it that matter, but the meaning behind them. We're a military family and I love displaying that pride for all to see. Hubby loves this little area and it brings a smile to my face. Then I stepped back inside and placed my new stove topper on. I stained it a dark red mahogany yesterday morning and it's been drying all night long. Ahhhhh makes me happy to see all these projects finished. I sat down with my crochet and finished my last little Spring Coaster, these work up so fast and I've made these 4 just between last night and this afternoon. I still want to make another 4 so I will have a set of 8. If you want to try them out for yourself, you can find the free download at Ravelry. These are by Doni Speigle and they're adorable. Now you may need to sign up to Ravelry to be able to see them and download the pattern, but it's a free site and I highly recommend joining if you love knitting and crocheting. Well I'm off for now, I have dinner to attend to and kids to kiss on. Have a wonderful night everyone! Building things for my home, woodworking, painting, putting work into something that I can then display in my house. Makes me really happy. An Absence so Great by Jane Kirkpatrick - For a review next week, I'm loving it already even though I just started the book this weekend. The Pacific - New HBO series about World War II, it just started and only the first episode is available, but it's amazing, I highly recommend it. Crockpot Nachos....YUMMY is all I'll say, if you want the recipe go on over to Full Bellies, Happy Kids. 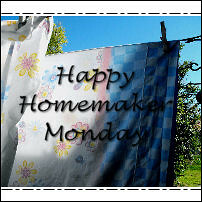 Though I will miss my kids as they return to school, I'm looking forward to some time alone with my sewing and crafting. To remove those tough stains from the bottom of a glass vase, just fill with water and add two Alka-Seltzer tablets! All my Spring Break posts, they may not mean much to anyone else but for me it's a record of my children and something that I'll one day enjoy rereading. Gumbo Lily - I found this blog last week and I'm so glad I did, I love it and I think my readers will enjoy it too. Just love this photo, I found it while browsing wallpapers online. 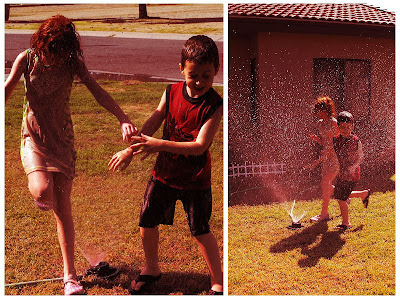 To enjoy every single minute with my children, make every hour count. My brother and sister in law's visit in June, I'm just beyond thrilled right now, I can't wait. The first postcards for my Postcard Exchange, which by the way, if you haven't heard about, you're missing out on a chance to join in some old fashioned fun bringing Postcard sending back to life AND entering in a chance to win an Arizona Themed Goodie box from me. A week of Spring Break with my kids, it was so nice having them home and getting to hang out. Some leftover fabric into the cutest Spring top ever. I can't wait to make more with what I have laying around. More crochet cupcakes and Spring Coasters which I'll share with you tomorrow. I'm so thrilled to be back into my crafting and sewing, it's so relaxing and rewarding. The best books at Barnes and Noble. Like Pride and Prejudice and Zombies and Sense and Sensibility and Sea Monsters and a few others. To stop saying tomorrow I'll do it......and to start saying "why not today". To live simply and fully and to enjoy every single moment of my day. Dancing with my Father and Mother Duet Winners! 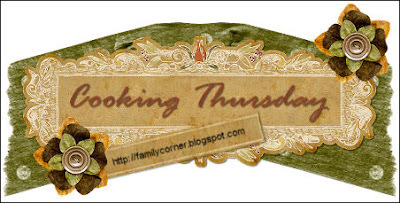 Raven's Ladder and Lady Carliss Book Tours! Rain makes for a Productive Day!